You need a Gutter Company you can trust. We have done the homework, and have foundSumner Roofing - in your area that has passed our seven point investigation and has proven to our team, delivers the best price, quality and customer service. Below, provide your contact information and we will have our trusted partner contact your within 24 hours. 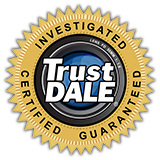 Your contact information also qualifies your purchase for the TrustDale Make It Right Guarantee. Thanks for your visit, and remember, you can TrustDale!